This was the first car to use an alternator rather than a DC dynamo. When I was a young man, several eons ago, I was reading a magazine one time (I want to say LOOK but it might have been something else.) David Eisenhower, the grandson of Dwight Eisenhower, was graduating from high school. He’s a year older than I am so it would have been about 1966. The magazine had pictures of him at that time, and he was showing off his gifts from his family (I don’t remember the details) and one gift was a Plymouth Valiant, a plain old 4door with blackwall tires. 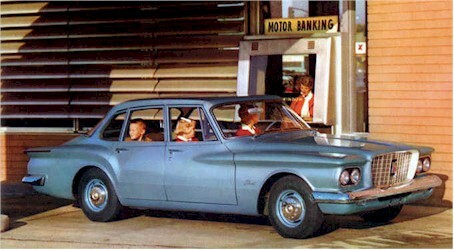 https://www.allpar.com/cars/plymouth/valiant-1960.html Being the car geek that I am, I noticed it was of the first era, 1960-62. I was just amazed that he received car that was already at least 6 years old and thought, boy, couldn’t his family have bought him a new car. And why I remember this 50+ years later, I’ll never know. The Dodge version was called the Lancer...made in 1961-62. Had one in the late '60s in college. The slant six engine was bullet-proof, and I never had any trouble with the transmission's push button gear selector. The car had rusted down to practically nothing by 1970! We owned a 1961 Valiant - 4-door sedan, manual transmission, red with white top and red interior (we were told the red interior was a factory mistake). Although my five siblings and I were all age 10 and under when we bought it, we all learned to drive in that car. My dad insisted that we know how to drive a manual transmission even though by then, our second car, a 1966 Plymouth Fury station wagon had an automatic transmission. His reasoning was there might be an emergency and the only vehicle available may have a manual transmission. He also insisted that we know how to change a tire. It may not have been the most attractive, but we loved that little car. We owned it for nearly 15 years. Thanks again, Alan. Dart reference removed from the title. That is a Valiant, but the Dodge Dart was entirely different. The '60 Dart (its first year) was a full size car competing directly with full size Fords, Chevys, and Plymouths. The Dart became an intermediate in '62, and a compact in '63. Dodge did have its clone of the Valiant starting in '61, but it was called the Lancer. 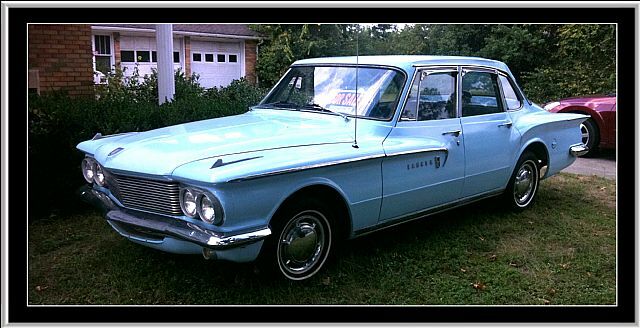 You are correct they were truly ugly, when first introduced, but the Plymouth Valiant/Dodge Dart improved their looks over time. Also, with the "slant six"engine they drove forever. My cousin had a 1966 Dodge Dart, that he inherited from his grandfather (who bought it new), which he drove until 1996, when it was stolen, no joke. Some say the "slant six "engine is what put the Chrysler Corp into it's first bankruptcy time. They simply lasted too long and no one came back to buy replacements. In my opinion, one of the ugliest cars to emerge from Detroit. Two other guys and myself drove one of these from Philadelphia to San Francisco and back, back in 1961. Out in the mountains of Southern Colorado, we neglected to check the water in the battery, and acid started eating it away. We thought the smell we sensed was from some obnoxious weeds growing along the road over Wolf Creek Pass.